A thorough analysis of the skeleton in the reliquary was conducted in 1946, but the availability of new methods of analysis motivated a new examination in 2014. On 23 April 2014, the reliquary was opened at a ceremony in Uppsala Cathedral. 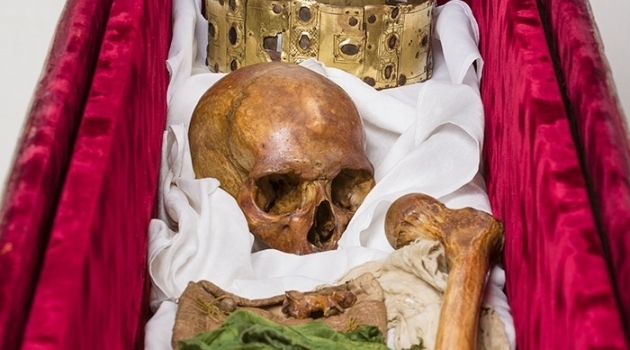 After this, researchers from several scientific disciplines set to work running tests on the remains in an attempt to learn more about the medieval king. Now, the first results of these examinations are made public. ’The interdisciplinary research collaboration on the analysis of the skeletal remains of Saint Erik provides extensive information about his health condition (orthopaedists and radiologists), genealogy (aDNA analysis), diet (isotopanalys), and his death (forensic medicine)’, says project leader Sabine Sten, professor of osteoarchaeology at Uppsala University. The reliquary contains 23 bones, seemingly from the same individual. They are also accompanied by an unrelated shinbone. The radiocarbon values measured in the bones are consistent with a death in 1160. The osteological analysis shows that the bones belong to a man, 35-40 years old and 171 cm tall. Examinations of the bones using computer tomography at the University Hospital in Uppsala found no discernible medical conditions. DXA- and pQCT measurements conducted at the same hospital found that Erik did not suffer from osteoporosis, or brittleness of the bones. Quite the opposite, as he had a bone density about 25 percent above that of the average young adult of today. King Erik was well-nourished, powerfully built and lived a physically active life. The isotope analysis points to a diet rich in freshwater fish, which indicates that the king obeyed the church rules on fasts, i.e. days or period when the consumption of meat was forbidden. Stable isotopes also imply that he did not spend his last decade in the expected Uppsala area but rather in the province of Västergötland further south. These conclusions should however be considered very preliminary, as there are as of yet very few other studies to compare the isotope values to. The opening of the reliquary also saw DNA samples taken. It is hoped that these will produce results that will shed new light on questions of genealogy. This analysis has not yet been completed, and is expected to take another year. The researchers can, however, reveal that the samples have yielded DNA information. The cranium in the reliquary is dented by one or two healed wounds that may have been due to weapons. The legends say that Erik led a crusade against Finland, which is thought to be a possible explanation of the injuries. The saint’s legend says that in the king’s final battle, the enemy swarmed him, and when he fell to the ground they gave him wound after wound until he lay half dead. They then taunted him and finally cut off his head. The remaining bones have at least nine cuts inflicted in connection with death, seven of them on the legs. No wounds have been found on the ribs or the remaining arm bone, which probably means that the king wore a hauberk but had less protected legs. Both shin bones have cuts inflicted from the direction of the feet, indicating that the victim lay on his front. A neck vertebra has been cut through, which could not have been done without removing the hauberk, i.e. not during battle. This confirms that there was an interlude, as described by the taunting in the legend, between battle and decapitation. At no point do the documented wounds gainsay the account of the fight given by the much later legend. The research results will be published in an upcoming article in the journal Fornvännen.